Ok first off I want to start off by saying the bad news (so we can end on a positive note of course). The bad news is that all my previous photos have been lost and will not be restored. So from now on I will just continue to upload pictures currently and past ones too but I won't be able to get them back. Good news is that I've ordered a few things that would help with my filming. It is this mini stand for IPhones (since I use IPhone to film) so I would have a better angle showing my work. Another good news is that I'm working on a lot of crafting charms so I wills be filming one! 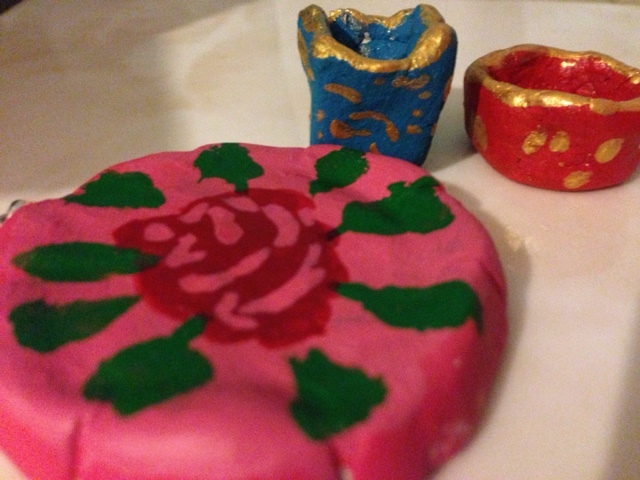 If you haven't already done so go check out my YouTube video on my last post on miniature clay pots and a necklace pendant too, so go ahead and check it out! I have finally uploaded my first clay video!! I'm so excited to show it to you all! I really hope you enjoy it!! I have great news I was finally able to finish my first crafting video and it should be up tomorrow after I do the rendering and uploading! I am so excited! The editing of this video took a lot longer then I expected so there was a lot to do and I couldn't record my voice in one part of the video - this was the same part that lagged on me too so you can skip that part - you will see the video and know what I mean. Also if you follow me on my Instagram and Twitter you should get good updates and notices on my video upload! If you follow me on my Instagram you would have already seen the picture of the final product so look forward to the video! I will post the picture on here now so you can all see it. I hope you all like it and look forward to the video! I will make more in the future hopefully! I also bought other types of clay and would be making some charms from them later on so there would be more videos to come! Just to let you know I can't post today, as you can see I have somehow deleted all my pictures and now my pictures are gone comepletely I don't know how to restore it! If anyone knows what to do please let me know! I need help to get my blog back on track! Sorry for the delay guys hope you are all well!! 1st craft video to come out tomorrow! Sorry for not posting anything sooner, but I was actually still filming my craft video I didn't know it was going to take so long! However, filming is now done. I am going to edit it and record my voice tomorrow (technically today) and upload it for you! I am so excited to share with you my first ever crafty video I hope you enjoy it a lot! :D Please look forward to as more in the future (hopefully - In Sha Allah). I have been waiting to do this for a very long time and now I can finally make some time to do so. So I will catch up with you all tomorrow, since I am excited to work on it!